At the risk of leaving things (or people out), here’s a list of things that stick out in my mind as the best parts of the tour. East to west is best. The conventional wisdom says that riding west to east is best because the winds are mostly at your back. If true, I totally lucked out with tailwinds. I was the envy of every eastbound bike rider I talked with. In Washington state, several people told me about the eastbound riders who quit after a week. The climbs to the series of five mountain passes are a brutal way to begin a tour. Wonderful solitude. With the exception of days with strong headwinds, I loved riding alone for hours and hours with my legs spinning away and my brain squirrels running all over the place. Time after time I would come to a place where I had planned to stay the night. 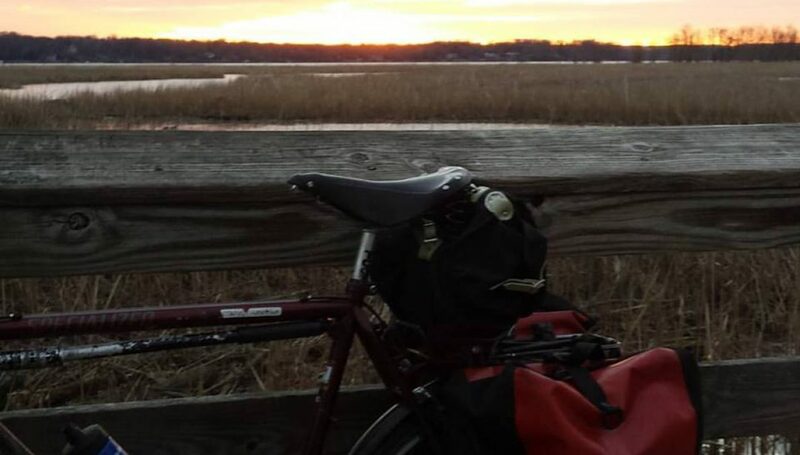 When I realized I had four hours of daylight left, I’d get back on the bike and pedal, simply because it was so much fun. Mindfulness in motion. Riding up the long hills and mountain passes out west should have sucked. (The steep hills in the east were another story.) Each one was hard in its own way. It would take a while but I’d get into the rhythm of the climb and just enjoy the view. When the road steepened, I’d look down at the twenty yards of the road in front of my wheel. All I have to do is pedal that far. Stay loose. Don’t tense up. Pedal smoothly. Breathe. Pedal that far. Pedal that far. Every twenty yards, simply begin again. Are you kidding me? Seeing a mountain pass sign a mile or two or three before I expected it was a great surprise. This happened at least three times. I was actually disappointed when I got to Rainy Pass. So early? I was robbed. Chuffed and knackered at the pass. When I got to the top of my first pass, Rogers Pass in Montana, I was hurting, then I saw the sign. I did it! More importantly, I knew I could handle the five passes yet to come in Washington state. My longest day ever. The 136-mile ride from Morehead MN to Gackle ND was epic. A mini-tour of Fargo. Chats with several eastbound riders. Tailwinds on a pool table. A doe and fawn in the grass along the road. Twilight on the prairie. A sunset seemingly too far north. Darkness. Bugs. No more tailwind. Rolling hills. Rain. An owl in the road. Finally, waking up Martin at the Honey Pot, the beekeeper’s house, just after midnight. Going down. Riding down mountains out west, especially from Sherman, Loup Loup, Washington, Rainy, and Wauconda passes, at 25 to 35 miles per hour for an hour or more. Surely this hill will end. Nope. On and on and on. Stay loose. Watch for bumps or cracks in the pavement. Look around. Let the bike run. Use the force, Luke. Square Butte. It looked like I’d be at its base any minute but the vastness of the plains distorted the sheer mass of the thing. It took hours to get close to it. I was shocked when I saw the sign indicating an 8 percent grade into the canyon around the butte. White crosses indicating fatalities all over the place. Do you believe a Mule can fly? Yes! Badlands, are you kidding me? I had no idea I was going to see a painted canyon. I could not believe my eyes. I just walked around the viewing area stupefied. WOW. The GAP Trail. I’ve ridden all or most of it five times. It never gets old. If you live anywhere near DC or Pittsburgh, you have to ride this trail. The Southside Travelers Rest hostel in Pittsburgh was a terrific place to stay too. Painted farmland. I was only in Iowa a couple of days, but I thought the farms planted in concert with the terrain were agrarian paintings. Grog and vittles. I can understand great craft beer in a big city like Minneapolis, but Wibaux, Kettle Falls, Anacortes, and Astoria? What a treat. Oh, and don’t forget the outstanding pizza in Minneapolis and Wibaux. Hosts of hosts. Whether they were people I knew from my past or from Warmshowers, I stayed with or visited so many people who treated me well. Pittsburgh, PA: Earl and Anne Price. Fed and watered me. Helped me find a belt. Gave me a cook’s tour of The Burg. Watseka, IL: The town park’s representative, a kid named Connor, and the town police officer all treated me like a visiting hero. Breakfast in the bar the next morning was a bit surreal, but my time in the park was splendid. Twin Cities, MN: Cathy Combs, Russ Pylkki, and Krista Combs Pylkki treated me to my first day off. I was more tired than I realized. Royalton, MN: Alice Winscher hosts touring bicyclists at Alice’s Attic. I stayed in the loft of her barn amid dozens of antiques. Morehead, MN: Terri Trickle and Drew Sandberg along with son Scott and dog Poppy made me feel like family. How can you not love people who keep cookies and snacks in their old oven? Seriously. Gackle, ND: The unseen Millers are migrant beekeepers, a profession created by their great grandfather. They put touring bicyclists up at their home. It’s a place called the Honey Pot. Missoula, MT: When my friends in DC heard I was going to Missoula, they all said you have to meet Emma Wimmer. Emma gave me a tour of the Adventure Cycling Association offices where she works and made several recommendations for my day off in Missoula. The next time she’s in DC, I’ll give her a tour of the fabulous Rootchopper Institute. When those five minutes are over, we’ll go for a ride. Republic, WA: Dianne Hewitt (a postmaster) and her husband Boyd (a gold miner) hosted Martin and me. They fed us to the max and talked our ears off. Bike Camp near Mazama, WA: Jim Gregg is the Gyro Gearloose of Warmshowers hosts. His bike camp includes an outdoor shower and a composting toilet. And, when the clouds go away, awesome views of the stars. Oh, and his dog Stout is an excellent co-host. Camano Island, WA: Tim Jones and Michele Wentworth took me in for a day off at the start of the home stretch in Washington and Oregon. I could have stayed on their deck gazing at Mt. Baker forever. And Tim set up a Facebook call with Steve Fisher, an old friend who lives in Prague. Portland, OR: No bike tour is complete without an attorney. Eric Koetting and I worked together as attorney and client off and on for over 25 years. Eric kept me fed and watered for three days. He took me to Multnomah Falls, a rose garden, a Japanese garden, and the spectacular Oregon coast. He also drove The Mule and me to a bike shop so that I could ship The Mule home. After that we went to an Army surplus store where I bought a duffle bag to consolidate my gear for my flight. And he drove me to the airport to boot. Portland, OR: Jeff and Shannon (my niece) Ryder let me stop in and play with their son Tommy who is learning to crawl. Friendipity. I am a total introvert. It takes me a very long time to feel comfortable with people. Three times on this tour I met wonderful people by pure luck. Martin Arnold quit his job in the elevator business and started his tour in Switzerland. It seemed that any time the grind of the tour was getting me down, Martin would just appear and cheer me up. We met or hung out in Gackle ND and Circle MT, outside Colville WA, and in Republic WA and Marblemount WA. I hope I cheered him up too. Martin would fit right in with the BikeDC crowd. Maria Mantas was my personal Rogers Pass welcoming committee. She took my picture then enthusiastically invited me to be her guest at the Montana Native Plants Society annual get together in the woods outside Lincoln. I didn’t learn much about plants but I did discover that hiking in the woods is hard on the body and good for the soul. She is without a doubt my favorite plant nerd. After I dipped my wheel in the Pacific, I needed a day to decompress. Out of the ether came Julie Councellor Crabtree. It may have only been for a couple of hours but our conversation was nonstop and effortless. A Hoosier transplanted to Juneau Alaska, Julie is an artist who, in addition to painting, makes jewelry from materials she finds in nature. She is also a Rolfer. Her finest creations are her two boys about whom she boasts with disarming charm and obvious momma love. The Support Team. Although this was a solo tour, I didn’t ride alone. I had tons of help. Thanks to one and all. Mrs. Rootchopper who held down the fort at home through torrential rains and searing heat and stifling humidity. Marie and Roy shared the blog of their 2015 tour along a similar route to mine. From time to time they left me comments on this blog about places to visit or avoid. There were trail angels too numerous to count. The woman who bought me breakfast in Pennsylvania. The man who guided me to a bike shop in Longview Washington. Stephen who showed me how to get out of Fort Stevens Park and back to Astoria. The motel clerk who gave me a towel to clean my chain. (It made it to Washington state.) The folks from Smith’s Bike Shop in LaCrosse WI who gave me energy gels. The ER at Sanford Medical Center in Bismarck was efficient and calming. I was seen right away. And best of all, the news was good. I did not have a blood clot in my leg and my tour could continue. I had tons of moral support from readers of my blog, in the comments, in emails, and on Facebook, Twitter and Instagram. Posted on July 28, 2018 August 5, 2018 by rootchopperPosted in Any Road to the Pacific NorthwestTagged Any Road Tour, bike tour, meditation, mindfulness.